The story of the city of Xanthos, one of the most interesting and attractive sites on the Mediterranean Coast, is a tragic one. In its heyday, it was the capital of Lydia, and the richest and most powerful of the Lydian cities. In the 6th century BC the Lydian Empire was at war with the Persian Empire, however, and the Persian commander Harpagos was laying ruin to Xanthos. Rather than fighting to the death and watching their beautiful city overtaken by the Persians, the warriors of Xanthos went back and burned their city, including all of the women and children inside, their wives and mothers, in 545 BC. In the 5th century BC the rebuilt city was again ravaged by a great fire of unknown cause. In 42 BC Xanthos was again devastated, by Brutus, and was rebuilt by Marcus Antonius a year later. 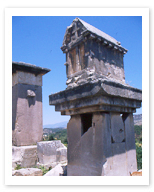 Not surprising for a city of such a history, Xanthos is known for its monumental tombs, testaments to loss. According to the Lycian faith, the lid of the tomb is shaped as an overturned boat, for “Life is like a boat flowing down the river, and with death, the boat sinks.” Only Xanthos’ stunning natural beauty matches its scope of history. Today Xanthos is scattered with many impressive ruins, including a Roman theatre and agora, Lycian pillar tombs, an arch in honor of the Emperor Vespasian, a Byzantine basilica, and a 5th century BC stone obelisk, which has been translated to relate the story of the young man unfortunately entombed inside that very obelisk.